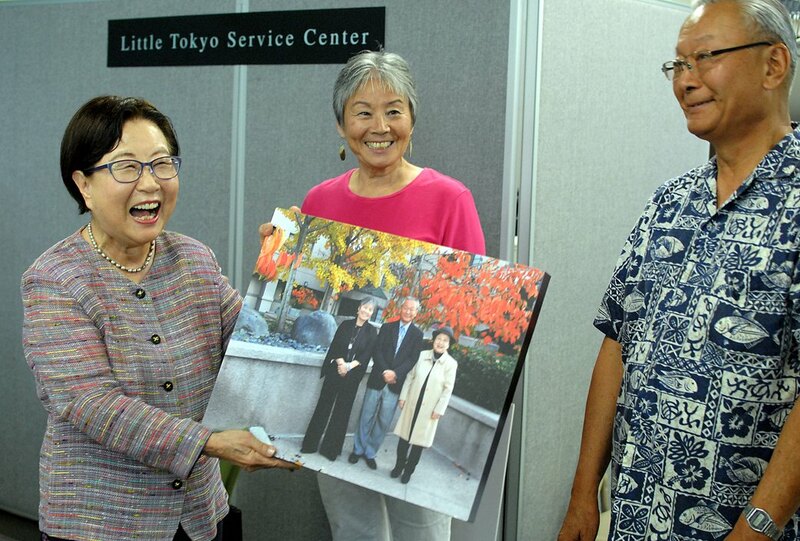 Former LTSC Social Services Director Yasuko Sakamoto (middle) and former LTSC Executive Director Bill Watanabe (right) present a gift from LTSC’s Social Services staff to Mrs. Kim (left). In 1985, a tragic event shook the Southern California Nikkei community. A monolingual Japanese-speaking woman, at the end of her rope, walked into the waters off Santa Monica with two infant children in tow. The mother survived, but her children drowned. Convinced the incident could have been avoided had the mother possessed a proper support system, members of the Japanese American community decided to create a crisis hotline to assist callers facing difficult times. With support from Little Tokyo Service Center (LTSC), the Nikkei Helpline (NHL) launched a few years later. Anna Kim — respectfully referred to as “Mrs. Kim” — later became the program’s coordinator. After nearly three decades of offering lifelines to Japanese- and Korean-speaking callers struggling with issues related to financial woes, relationship crises, immigration, education, illness and other emergencies, Mrs. Kim announced her decision to retire last month. At a Little Tokyo gathering to celebrate Mrs. Kim’s contributions, friends and colleagues heaped praise on a tireless community worker whose wisdom and selfless dedication allowed her to touch numerous lives. Over the years, Mrs. Kim earned a reputation for consistently going above and beyond. In addition to working the helpline, she trained volunteers, assisted seniors, engaged in outreach at various community centers and hot meal programs and worked in the office as a receptionist. Though Mrs. Kim’s contributions as an employee of LTSC will be dearly missed, she still plans to volunteer for the Nikkei Helpline during her retirement. Those in need of a supportive voice during trying times are encouraged to call the helpline at 800-645-5341.